Skinwalker is a paranormal mystery set in urban New Orleans, a very appropriate setting for this genre. 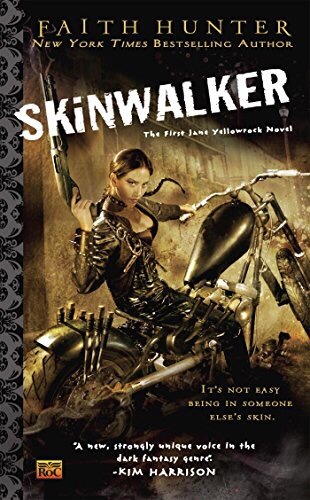 What makes this book different than other paranormal books I’ve read is that our protagonist, Jane Yellowrock, is a Skinwalker and I’ve never read a book where the Skinwalker wasn’t an evil character. Skinwalkers can take the shape of any animal, and as Jane takes shape we see her struggle with her inner beast. I found that struggle to be just as interesting as her investigation. She is inhuman, yet that struggle humanizes her and makes her someone we can identify with and like. Jane is hired by one of the oldest vampires in the city to find the serial killer who has been killing members of the vampire population of New Orleans. This New Orleans is dark, gritty and dangerous, a perfect backdrop for all of the unsavory characters we meet in this book. As the first novel in the series there is a lot of character development and world building, but I am looking forward to hitting the ground running when I pick up the second book. Jane’s world may not be one I’d want to inhabit, but it is a fascinating world to read about and here were quite a few surprises as the mystery unraveled, making this book a hard one to put down. Oh cool, this has always been on my list if things to read! Mine too! I decided it was time and I’m glad I did! It’s dark fantasy and very original.